In case you’ve missed it, and given the reluctance of the MSM to get into this sort of thing, you probably have, there are two pretty interesting religious “stories” kicking around in the background to the Republican presidential contest. You’d never know it from Ben Carson’s exhortations for Americans to arm themselves against perpetrators of gun violence, but a central belief of his religion, Seventh-day Adventism, is in non-violence. From the founding of the denomination in 1863, both doctrinally and culturally, Adventists have been “non-combative,” and their status in wartime is that of conscientious objector, said Alexander Carpenter, a writer and academic who serves on the board of Adventist Forum, a liberal non-profit that publishes the independent journal Spectrum. In his statements about guns and gun violence, Carson “is not an authentic Adventist,” added Carpenter, who also has taught at Pacific Union College, one of a dozen Adventist colleges and universities in the United States. Many Adventists have served in the U.S. military, but refused to carry weapons. Others served in the medical corps. Still others, such as the young medical students at the Adventist Loma Linda University medical school, volunteered during World War II to be medical test subjects rather than engaging in combat. Adventists also have a robust history of supporting church-state separation, notes Posner, as you might expect from a faith community that considers all human institutions presumptively wicked and fears persecution from government aligned with larger Christian denominations. 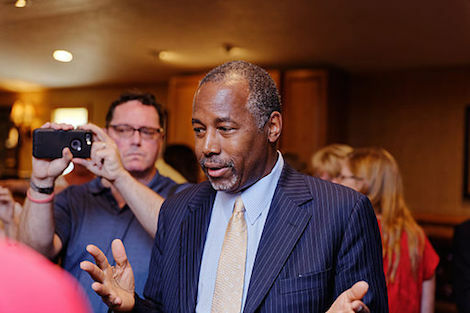 And so whereas Ben Carson will exert a pull on Adventists as the first member of their community to make a serious run for the presidency, his own profile on religio-political issues is more attuned to the conservative evangelical Christian Right, which is by no means a predictable or arguably even acceptable Adventist position. Carson’s fusion of religion and American-ness—rooted in the Tea Party and religious right rhetoric about the “Christian nation” and disdain for “political correctness”—is drawn from American conservatism, and is in many ways contrary to Adventism. Mother Jones’ David Corn, for example, recently documented Carson’s affection for W. Cleon Skousen, the Cold War-era writer and conspiracy theorist long popular with conservatives and the religious right, and more recently with Tea Party activists. But it is “not common,” said Carpenter, for Adventists to affiliate with the Tea Party. While central to religious right activism, abortion has not been a “wedge issue” for Adventists, said Carpenter. That issue, along with guns and religious liberty, are “three things that would create wedges between him and his base and make him choose between his faith and his politics,” he added. Carson could even wind up in the anomalous position of getting “blamed” for controversial Adventist beliefs even as he distances himself from Adventist political traditions. The candidate with the most obvious claim to the community is Rubio, who was baptized Mormon as a child and attended the local church with his family in Las Vegas for a few years before eventually moving to Miami and returning to Catholicism. During his brief time in the faith, Rubio joyfully immersed himself in Nevada’s Mormon culture — frequenting LDS youth groups, taking family road trips to nearby Brigham Young University, and even forming an amateur singing group with his cousin and sister to perform their favorite Osmond Brothers songs…. Clearly, Rubio’s biography is a bottomless well of attachments and metaphors his campaign is actively exploiting.